MLB Spring Training is a sequence of practices and games beginning in mid February and lasting approximately six weeks, ultimately ending in early April. Spring training allows the upcoming players to try out for spots, and test their skills in the MLB environment, and allows the existing players to hone their skills before the regular season starts. 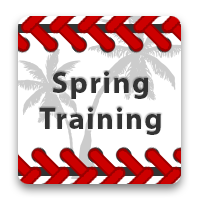 The spring training schedule fits very well into the college students’ schedule, and proves to be a popular way to spend their spring break. Spring training has two leagues, the grapefruit league and the cactus league. The grapefruit league is located in Florida. The Philadelphia Phillies spring training program was the first Major League team to play out of Florida. Today their home field is currently Brighthouse Field in Clearwater, Florida. Another popular team located in Florida’s Steinbrenner Field is the New York Yankees. Jet Blue Park at Fenway South is located in Ft. Myer Florida, and is home to the Boston Red Sox during Spring Training.